It takes a lot out of a man, dying does. Doc Holliday is on his deathbed, dying of consumption in a Colorado hospital. His recent adventures have taken quite a bit out of him, and there is little that 1880’s medicine can offer him anymore. As he lays in his bed, though, an owl which had been watching him from the outside flies into his room and turns into the great Apache medicine man, Geronimo. His past dealings with Doc Holliday lead him to know that the man, even on his deathbed, is a dangerous individual, and Geronimo offers him a choice: a longer life in exchange for stopping some paleontologists from plundering Indian lands in Wyoming. Of course, Doc is a little confused at this, because as far as he knew, Geronimo lived much further south. When Geronimo explains his reasoning, Doc agrees, and his mediocre health is partially returned. Doc quickly finds the closest saloon (it’d been a long time since the man had a drink, and he gets cranky) and, while proceeding to enjoy the partial health restored by Geronimo, is greeted by his friend Thomas Edison, who had arrived with Ned Buntline to say goodbye to the man they had believed to be on his deathbed. Surprised, they find out the reason that Geronimo has kept Doc alive, and agree to assist him in stopping the two greatest paleontologists of the time — Edward Drinker Cope and Othniel Charles Marsh — before the Comanches raise all of the dinosaurs in their sacred burial grounds and kill everything in the West. As Doc arrives in Cheyenne, Wyoming, he quickly discovers that there is a title bout for the boxing heavyweight championship of the world between the champion, John L. Sullivan and a local champion, Bill Smiley. Refereeing the match is none other than his old friend Theodore Roosevelt, the main reason that Doc is interested in the boxing match at all. With Doc firmly entrenched in his mission for Geronimo, Theodore agrees to assist his friend, since it will be a good old romp of an adventure and, as the book moves along, that’s all Theodore Roosevelt really wants. Part of the allure of the book (or the series, for that matter) is the careful blending of the steampunk within the Wild West as our memory and fanciful books portray it to be. There are less showdowns in the town square and more drinking and gambling, and while Doc Holliday is a stone-cold killer, he doesn’t go out of his way looking for fights. Indeed, one of the primary reasons that I love this series is the author’s portrayal of Doc Holliday. The only other man to ever capture my preconceived notions of the man was Val Kilmer. Resnick does a wonderful job showing the edginess of Doc without coming off as an unlikable character, primarily by surrounding him with a very likable cast of characters (Ned Buntline, for example, is a stark contrast to Doc Holliday, and it completely works). While The Doctor and the Dinosaurs seems like a reach at first, the author does a wonderful job in drawing you in to the story while setting up the finale. The story does meander a bit as Doc travels between the two rival camps of paleontologists, but this is a temporary distraction and only slows the story down briefly until Doc Holliday and Theordore Roosevelt come face to face with a beast of nightmares. 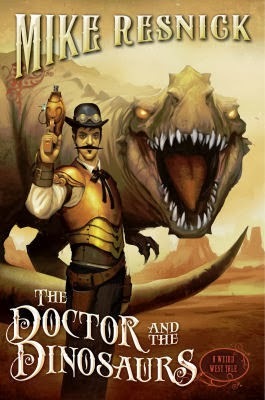 Filled with suspense and drawing upon the legends of men and steam-driven machine, The Doctor and the Dinosaur is a highly-recommended read and wonderful addition to Mike Resnick’s Wild West series. Solid, solid work, and a must buy book for the lover of the Old West. This entry was posted on November 25, 2013, 10:00 am and is filed under Book Review. You can follow any responses to this entry through RSS 2.0. You can leave a response, or trackback from your own site.